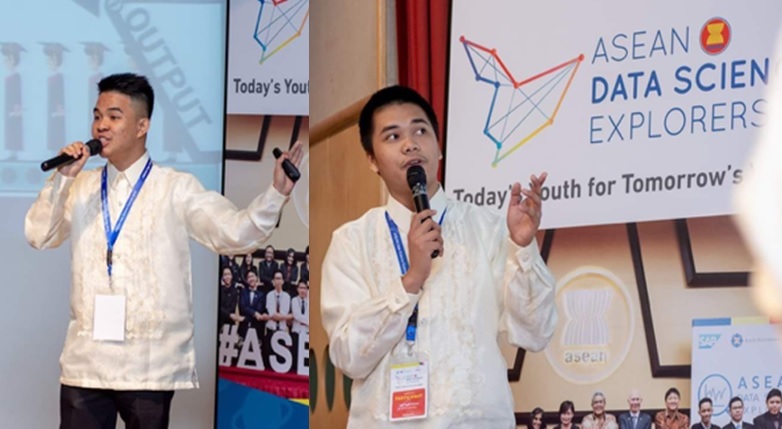 MANILA, Philippines – Filipino students bagged the second place in the regional finals of the ASEAN Data Science Explorers (ADSE) competition for their insights and data-driven solutions to solve the region’s pressing social issues. Congratulations, Jade Hizon and John Rusty Perena! Their project focuses on how entrepreneurship education can empower students to turn their ideas into actions. It aims to produce graduates who are job creators and professionals with an entrepreneurial spirit who are more productive and self-sufficient in a bid to solve the perennial problem of unemployment in the region. The experience was memorable for Jade and Rusty, who first bested Team Bazinga of Mapua University and Team Tony of De La Salle University in the Philippine national finals before moving on to the regional finals to become the runner up among all ASEAN country finalists. “Team Dimicrocambio displayed great passion in tackling today’s social issues through their project, ‘Recalibrating educational gears through entrepreneurship education,’” said Edler Panlilio, managing director, SAP Philippines. Coinciding with Singapore’s ASEAN chairmanship in 2018, Singapore played host to the competition, now in its second edition running. This year, the initiative reached out to 5,000 youths across 175 institutes of higher learning in ASEAN to increase their digital literacy and cultivate a greater sense of responsibility and ownership of the region’s future. Team Plan B of Singapore, comprising Tay Kai Jun and Madhumitha Ayyappan from NUS High School of Math and Science were crowned the ASEAN champion at the regional finals. Their winning project, ‘From Slumming to Sustainability’ aims to galvanize ASEAN to transform slums into sustainable microcities.